‘Walking is the best medicine’ – We’ve all heard this phrase multiple times. But how many of us actually take this seriously? Did you know that walking for a couple of minutes every day can extend your lifespan by a few years? Reasons for the same being that when you walk, you become fitter, and your body’s immune system tends to improve, thus, keeping illnesses at bay, and thus offering you a healthier and disease-free life. Walking lowers your bad cholesterol levels and controls and prevents high blood pressure, which are the primary causes for stroke and heart diseases. 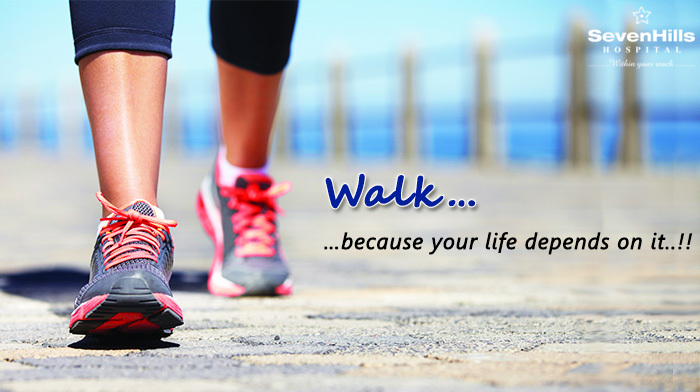 Being a great cardio exercise, walking helps in keeping your heart healthy and lowering stroke and attack risks. Walking slashes the risk of type 2 diabetes, and helps in lowering the risks of developing cancer of the colon, womb, or breast. If you’re seeking at losing weight the healthier way, then walking is the way to go! Regular walking for about 30 minutes helps in losing those kilos in the easiest of ways. Increase your pace and duration, and you can shed your weight in no time! Walking increases blood circulation, and this helps in keeping your brain active. Hence, it is less likely that you’ll suffer from brain shrinkage or memory loss in your later years. Regular walking gives definition to your legs, calves, bums, waist, abs, and so on. In other words, it improves your posture and strengthens your muscles, thus making them fit and giving them the required toning. Brisk walking boosts circulation and increases the supply of oxygen in your body, making you feel more alert, energetic, and alive. Walking in the morning gives you your dose of Vitamin D that makes your bones stronger. Studies have shown that walking has helped people in pulling up their lower moods. It helps in fighting mild to moderate cases of sadness and depression, and also helps in reducing anxiety and stress. You feel relieved and happier, and thus live longer. Bottom line: Practice regular walking, because your life depends on it..! !